No ban on military bases in border area! BELIZE CITY, Thurs. July 30, 2015–Four ex-Foreign Ministers who served at varying points between 1998 and 2008, the decade when the Opposition People’s United Party was in office, have issued a joint statement refuting claims made on Monday by Guatemala’s Foreign Minister Carlos Raul Morales that Belize and Guatemala had agreed “to not build another military base” in the border area after their 2000 agreement. Of note is that while Guatemala has not exactly built any military bases on the border with Belize, it has within the recent years been bolstering several military bases, apart from constructing new ones inland, with several millions of dollars in US aid, which are said to be a part of the anti-narcotics strategy for the region. For example, in August 2009, it reportedly received US aid to the tune of over US$1 million for a Special Forces (kaibiles) base in Poptún, Petén, just west of Belize. A news report published in 2013 talks about the US expanding its military reach in Central America, and mentioned Belize as one of the countries where the US would build military bases. We understand from an official source that the US had, some years ago, proposed to build a military base exactly at Sarstoon Island, but Belize Government officials did not approve. 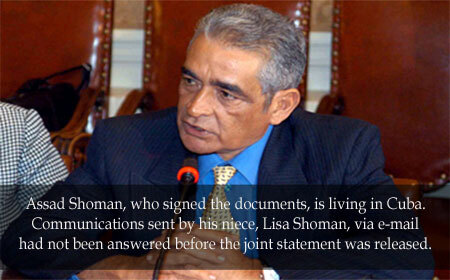 However, the agreements we have seen, dated 2000, 2003 and 2005, have no such clause; and this was affirmed today by four of the five Foreign Ministers who served at varying points between 1998 and 2008: Senator Lisa Shoman, ex-Foreign Minister and the current representative of the Opposition Leader Francis Fonseca on Belize-Guatemala relations, along with former Prime Minister Said Musa, who also served as Foreign Minister, and his successors Godfrey Smith and Eamon Courtenay. We understand that since Morales made the statement on Monday, an attempt has been made by his colleagues to reach the 5th ex-Foreign Minister, Assad Shoman, whose signature appears on each of the aforementioned agreements, but there has been no reply to the e-mail correspondences. We understand that Shoman is now domiciled in Cuba. 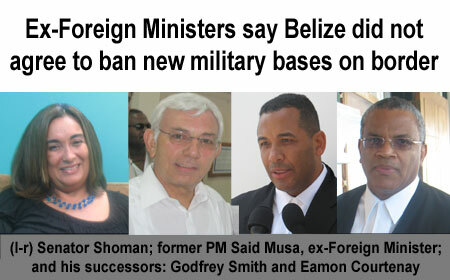 Belize in 2000 and in 2005 ‘took the decision to not increase the military bases in the vicinity of both countries…’” the Ministers began. They added that no decision or agreement was ever made with Guatemala, in the years 1998 to February 2008 by the Government of Belize on the question of increasing or removing military bases in either Belize or Guatemala. The ex-Foreign Ministers furthermore contend that the agreements never included any decision or directive in respect of any military base, or any other manner of operation post, conservation post or forward operating base. After Morales made his statement on Monday, about the parties having agreed not to put up new bases in the border area, Belize Foreign Minister Wilfred Elrington seemed to concur that no action has been taken which runs contrary to the stance taken by Guatemala. “Since we have been in government in 2008, Belize has built no military base along the border anywhere. We have operating posts along the entire western border to protect the border from criminal activity and for people who are coming in unlawfully. A similar type of operation was agreed upon as early as 2008 to be put on the Sarstoon side of the river. As far as I am concerned, that decision still remains,” Elrington commented. The Guatemalans had previously said that the base, which they believe would have been constructed by Belize’s military, could not be constructed before the territorial differendum is adjudicated at the International Court of Justice (ICJ)—a path to which electors of neither countries have agreed, since plans for a referendum have still not come to fruition. Last week, the PUP issued a July 4 resolution in which the party declared that it is withdrawing its support for the ICJ route of resolving the territorial differendum, in protest, it says, of the ruling party’s way of handling the process, without the consultation that they believe needs to occur with both the Opposition and the wider populace. At Tuesday night’s Culture of Peace Forum, though, Foreign Affairs Minister Wilfred “Sedi” Elrington spoke of a time, just before Independence and under the administration of the People’s United Party, when there were proposals on the table to make Belize the 23rd department of Guatemala, to give Guatemala unfettered access to certain cayes as well as free passage through the territory, and to give Guatemala control of certain aspects of Belize’s national defense—all of which were riotously resisted by the Belizean people.